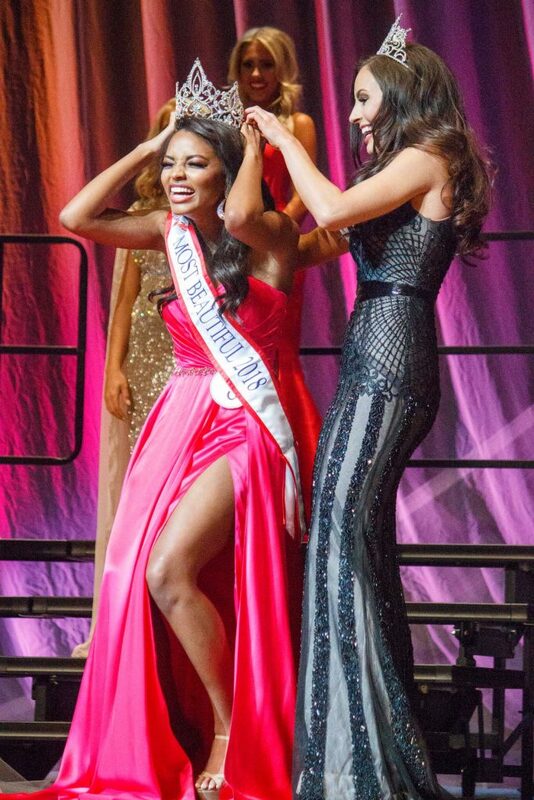 Falling to the stage beneath her, Miss Mississippi 2018 pointed to the sky in celebration as a crown was placed on her head. After three years of standing on the Vicksburg Convention Center stage, Ole Miss Most Beautiful Asya Branch clinched the coveted state title. The Booneville native began her pageant journey in 2016 after her senior year of high school. Branch originally intended to get her feet wet in the Miss Mississippi Organization by competing in the state’s Outstanding Teen pageant, but was ineligible because of her age. This led Branch to venture outside of her comfort zone and sign up for her first Miss Mississippi preliminary pageant. That year, Branch was crowned Miss Historic Crossroads. The title allowed her to compete in the 2016 Miss Mississippi pageant for the first time, where she placed 11th overall and received a preliminary swimwear award. Branch would continue to compete the following year as Miss All-America City, and be named fourth alternate at the 2017 Miss Mississippi competition. At this year’s 2018 competition, Branch took to the Miss Mississippi stage as Miss Tupelo alongside 49 other contestants. She performed her talent in a beaded, silk evening gown, showed off her dedication to a healthy lifestyle in swimwear, confidently answered an onstage question and partook in an interview with a panel of judges. As Miss Mississippi, Branch will travel the state to make appearances, volunteer with charities and spread awareness of her personal platform, empowering children of incarcerated parents. During her year of service, she hopes to be a positive role model and represent her state well. Branch said she sees her title as more than just a crown, and has already served Mississippi by donating medical supplies to Batson’s Children’s Hospital, as well as spending time with the hospital’s patients. In addition to serving the state, Branch will represent Mississippi in the Miss America pageant in September. She will continue to train for the competition by practicing her talent, completing mock interviews, exercising to stay fit and keeping her knowledge of current events up to date. If Branch is crowned Miss America, first runner up Tanner Fant will take on the duties of Miss Mississippi. Branch will then travel around the United States as the face of The Miss America Organization. For now, Branch is still trying to wrap her head around her newfound title. Throughout the past week, she has received an abundance of support from her friends, family, fellow Ole Miss students and Mississippi residents. She said she is thankful for all of the encouragement she has received, and looks forward to the year ahead.